Scott has been going through a period of creative crisis. He'd grown tired of the paintings he's been doing for the last few years. His galleries love his figure work and would often call and specifically request that he paint pieces like others he'd already done. He makes his living painting and so he'd do it, but the work was just that. It felt joyless and stale. Today he tried something different. He tuned in Brazilian music on Pandora and he did this abstract piece. 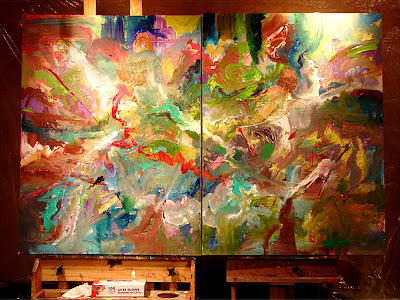 I saw a joy in his movement and in his painting that I haven't seen in a very long time and I just love these. Sometimes I sense the same creative crisis when I read books by certain published authors. That joy and natural flow that was in earlier work is suddenly gone. The book in my hands feels like the product of a loveless marriage between the author and her publisher. I wonder how common it is for an established author to be asked to reinvent work that's shown itself to sell and I wonder how often it kills the love of writing in a person. The romance is back for Scott and I think it shows. What do you think? 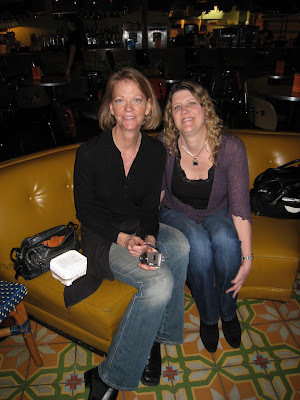 ...And I have some great pictures from Carleen Brice's very fun book launch party that I'll post later. I've been woefully absent from Eudaemonia and from all of my favorite blogs these last two weeks -- business travel, lots of work, blah blah blah -- and I confess I've also been spending a little time at my other blog too. At the risk of cross-pollinating these two very different forums, I'm going to link to the first of a series of 8 posts I put up at Compassion in Juvenile Sentencing today. The posts are a fairly lengthy Q&A that I did through the mail with Jacob Ind, one of the 46 juveniles serving Life Without the Possibility of Parole in Colorado. He was incarcerated at 15 and is 30 now. Of his time in prison, over half of those years have been spent in Supermax, where he is today. The focus of the Q&A is on Jacob's experiences entering prison as a juvenile, the phases he's gone through and what prison culture is like. I found his answers to be fascinating. As most of you visiting are writers and some are sociologists and psychologists, I thought this rare glimpse into the world and the thoughts of someone who has literally grown up in prison might be of interest. Chapter 10 of the Dickens Challenge should be up by Sunday and my somewhat normal, bordering on obsessive visits should resume soon. Tonight I had the pleasure of meeting the absolutely fabulous, funny, beautiful, wise and warm (and terribly fit) Patti from the Patti-O, here in her hometown of San Antonio. She surprised me with this way cool gift bag filled with Fiesta goodies -- and yes, those are tiny umbrellas for "umbrelly drinks". Fiesta is a major celebration that takes place here in April -- all I ever knew about it was that I can never find a soul in the office that week, but should I find myself in town this year, I will be well supplied. 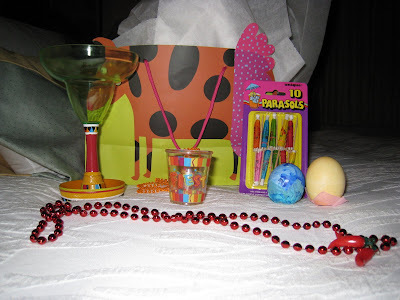 I have my own margarita glass with sombrero base, shot glass, suspended by beads so I can wear it around my neck, beads with chili peppers, tiny umbrellas and the eggs -- arghhh, now I can't remember what they are called -- dyed and filled with confetti so that you can smash them over people's heads! What a welcome! Someone recently said the cool thing about the blogosphere is that it helps us find our people. So glad I found Patti! There's a link to Suitcasing under my writers' blogs. Daniel Wallace is a fascinating young writer from the UK who has lived as an expat in Taiwan and more recently in Syria. Over the last several months he's been applying to a number of MFA programs in the US and will be visiting the states, arriving in New York City in late March. If you'd like to host a charming and talented young English writer during his visit, please get in touch with Daniel. I've been following his adventures on his blog and have had the good fortune to read some of his fiction -- which is fantastic. Please check out his post on the upcoming trip here. "On Thursday morning, I received my first offer from one of the MFA courses I applied to. Lots of questions still remain, and I’m still waiting for a response from the other seven colleges, but it has been a wonderful relief. I suddenly have a much clearer idea of what I’ll be doing for the next 2-3 years. It’s going to be a huge change. My life, especially over the last several months, has felt very stark - living in a strange country with only books for teachers. The thought of being in university and taking classes in Jazz Theory now seems so wonderful. I’m trying now to handle the waiting period, which is turning out to be much harder than the hoping period. A few days ago, I doubted if I’d get in anywhere, but essentially I felt relaxed. Now that calm has gone, and I feel the urge to check my email every few hours. It’s impressive, isn’t it, how hard ones demons work? On the positive side, this means that I’m going to be visiting the US soon. I’m going to fly to New York sometime in late March, visit various people on the East Coast, and possibly head into the Mid West if those colleges want me. If you are in the East Coast area, or know someone who might like to have a wandering English writer as a guest, let me know. I’m going to be living in Syria for one more month, and going to try to stay focussed on my novel writing until I leave. Best wishes to you all; I’m feeling very grateful for the life I’ve been able to lead." It’s Black History month and I feel a perfect storm brewing. I’ve always had a strong feeling that it’s important to highlight the many achievements of black Americans, which for so long were excluded from the history books, but I have a growing longing for black history to become a seamless part of “our” history. I believe I feel it happening. I’m an Obama supporter. He inspires me and makes me feel like “we” can be a great nation and feel good about ourselves as Americans again. When he says "we", I picture every last one of us. I haven't felt like I was part of a "we" for a long time. This video was one of my favorites from the late 80’s. This was another. I’ll never forget the first time I actually saw it. I was stationed in Germany, so MTV wasn’t a part of my life then unless someone got a videotape in the mail. But I heard Living Colour on the radio and they rocked. When I saw the video and realized they were black, I almost fell over. It was one of the coolest things I’d ever seen and it wasn’t at all what I was expecting! It wasn't that they sounded especially white, it was that they were breaking into a sound I'd never heard from black musicians. Vernon Reid is listed as one of the top 100 guitar players of all time and Corey Glover has gone on to a successful musical and acting career. It was a very cool time in music with a lot of crossover between heavy metal, funk, punk and hip hop with bands like Living Colour, Jane’s Addiction, The Red Hot Chili Peppers and Faith No More -- all my faves from that period -- and gosh, I was years from 30 then! “The Black Rock Coalition was founded in 1985 by guitarist Vernon Reid, journalist Greg Tate and producer Konda Mason in reaction to the constrictions that the commercial music industry places on Black artists. For me it was the start of something very cool in the music industry. 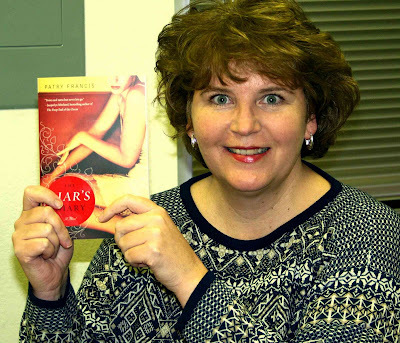 "RingShout was founded following Martha Southgate's essay "Writers Like Me" in the New York Times Book Review in July of 2007. The response in the blogosphere and in the literary world was enormous. So Martha wanted to harness this energy. She contacted Cornelius Eady and Alison Meyers of Cave Canem , a group she greatly admired, for insight into how they had formed their organization. The next step was contacting several writers, editors and a bookseller (Sarah McNally of McNally Robinson Books who participated in our first couple of meetings) who she knew and respected. The five got together over a period of six months and brainstormed until they had come up with a way to form a book list and a tool kit that would help carry out the group's mission. We kicked off with a party to drum up support and volunteers on February 1, 2008. At the present time, we remain an all-volunteer effort that is unaffiliated with any larger organization." Writers (black, white, Latino, Asian, Indian, everybody!) please check it out. The most recent post is about a desire for "our books to be for everyone--Barack style." This new blog has brought to the forefront a conversation that many of us have been having on and off for a long time. A fine book is a fine book and needn’t be separated into an ethnic category and I’m delighted to have discovered some new voices in American literature. “We’ve” got some cool things happening. Chapter Nine of The Foundling Wheel, my Dickens Challenge experiment in progress is not going to be ready this week. I’ve had too much going on this week to let Tracy and Aaron and Natalie back in to show me what happens and how. The interesting thing is that I have had just as much time to squeeze in the work as I always do. The chapters have been averaging around 2,800 words – but the time isn’t the issue, it’s my inability to shift mental gears. I’ve got part of a rough draft, but not a first draft. I wrote the last chapter I posted on the flight coming back from DC a couple of weeks ago, so I may find the time to do this sooner than I think, but as of right now I’m planning to be back on schedule next week. Tonight, Scott and I attended a fundraiser for The Pendulum Foundation and an airing of the Frontline Special, “When Kids Get Life”. On January 21st, I started a new blog called Compassion in Juvenile Sentencing and I’ve been Googling my fingers to the bone, trying to research the issues – if you’re interested, please check it out and email me your thoughts on the blog. There are so many parts and pieces to this issue that trying to address it at all is like trying to boil the ocean. It was a sobering, but was also a nice experience that gave me a sense of community and brought home the reality that what these families are going through, could happen to anyone. I met several of the parents and family members of people who were convicted of crimes as teenagers and sent to adult prison for life without the possibility of parole. People don’t talk about it much, but most of the parents know that not only will their children die in prison, but they will die while their children are in prison. These mothers and fathers come from all walks of life and they are a group that most people don’t think much about, but they are us. I met a retired Colorado State Representative, the columnist who write a piece in the Denver post in January about Erik Jensen, and a number of young people who heard about the event and who believe that what we’re doing with children in this country is wrong. Tomorrow, I fly out to Washington, DC and go immediately to meet with a young man who I hope to hire to work with me on my sales team. Tuesday, I’ve got a meeting with a government agency to work out how they’ll purchase the product I sell – and I need to finalize my PowerPoint presentation and email it out to them tonight because I can’t take a laptop into their facility. Friday we take off for four days in Estes Park with Wes and Nicole Hyde, two of our artist friends and then the following week, I’m flying down to my corporate headquarters for our annual sales meeting. Bonus: It’s in San Antonio and I also have plans to meet Patti from The Patti-O while I’m down there. I was honored with the Excellent Blog award by Liz Fenwick and there are so many excellent blogs out there that this it’s awfully tough to choose, but I’m going to name five of them that I find excellent: Kristen Spina, Charles Gramlich, Carleen Brice, and Iyan and Egusi Soup. Each of these bloggers has posted about something recently that I especially needed to hear. I Killed Hemingway, by William MCranor Henderson. I just finished it last night and had naturally not shelved it yet. Bill Henderson has a great writing blog and is a participant in the Dickens Challenge. The main character is having a conversation with a young woman about a friend of hers and her odd fear that extraterrestrials are eventually going to come and take her. Okay – I’m going to cheat here and post an excerpt further down the page because the next three sentences were very short. Call me a cheater if you want. Okay, I can’t count either. I’ll go ahead and tag five more people to do this (probably the only part of the directions I can follow). How about Larramie, Patti, Shauna, Rebecca and Karen. Let’s see if you can follow directions any better than I can. And although I’ll be out of town for the big day, Tuesday (I believe) is a very big day for Carleen Brice with the release of Orange Mint and Honey and Therese Fowler with the release of Souvenir. Support your fellow blogger authors and tell everyone you know to buy these books! It’s kind of weird that I’ll only be “off the grid” for a couple of days, but it’s amazing that it feels like I’m getting ready to go on a safari to some no-man’s land and I’m going to miss something terribly important! I’ve thought about our constant connectedness quite a bit and how it impacts what we write. For example, in a story told in the present day, it’s nearly impossible to write a realistic scenario where a character can’t contact someone or be contacted almost immediately. Conversely, when I joined the Air Force in 1980, went through basic training, then technical training and on to my first assignment in England, I was virtually unreachable except by letter. Even when I lived in Germany from 1985 to 1989, I didn’t have a telephone. There was no reason to take on the expense because it was too expensive to call the States or for them to call me (answering machines were also not in common use yet). So my question is, how do modern means of communicating find their way into your writing – or not? Or, if your writing takes place in the past or in another world, how do the available means of communication factor in? Sometimes I think that the instant communication that’s so prevalent in movies and books provides an unwelcome deus ex machina that makes it harder to stress the characters out and makes things a little too convenient. What do you think? Cyndi Mueller, on of my fellow Dickens Challengers has received her copy of The Liar's Diary and sent a picture to prove it. Her note to me said, "I got my new book today! Thank you very much! See how happy I am (sometimes when I'm happy, I look terribly startled and kinda green - I guess)." Cyndi is our comic relief in the Dickens Challenge and in addition to her great Dickens piece, she's got some really funny posts at her place. Have you gotten your copy of The Liar's Diary yet? Cyndi's Dickens Challenge novel is called Casual Duty and her character and setting have some spooky similarities to my own. We're starting to believe we may have been separated at birth, two women, the same age, who entered the military in 1981 and are (gasp) step-grandmothers! Coincidence? Perhaps, but then again... Check out this work in progress at Cyndi's place! Cynthia Mueller is a US Army veteran living in Las Vegas, Nevada. After more than 15 years as a technical writer, she’s working on her first novel, Casual Duty, a mystery/thriller set at a remote Army post in the southeastern Arizona mountains. When the bodies of young women start turning up on the training range, Private Bridie Traynor must overcome her fear and lack of experience to help stop a killer before he kills again. Rather than just list the books I’ve read in 2008, I thought I’d copy what Tim Hallinan started doing and post about the books I’ve read each month. Forgetfulness, by Ward Just is a book I picked up while browsing the front table at the Tattered Cover. This was at times a bit slow, but it explored some significant issues with regard to our post 9/11 emotions and views on terrorism and on being an American. I liked Just's narrative style and this book made me want to read more of him. Josie and Jack, by Kelly Braffet: I bought this one based on Josephine Damian’s review. For anyone who reads Josephine’s blog, you’ll know I was intrigued by her enthusiasm for this one since JD starts far more books than she finishes. She’s a tough critic. I enjoyed the book and I thought it was well plotted and well written. Elmore Leonard's 10 Rules of Writing, Illustrated by Joe Ciardiello. I hesitated to even list this one because it’s only 96 pages and most of them have illustrations or single sentences on them. I bought it when Tim Hallinan referenced it in his Writers Resources pages. It’s quite charming; it cuts right to the chase and is a good book to leave around just to have a quick reminder about some of the fundamentals. This would be the perfect gift for a writer. Twinkle, Twinkle, by Kaori Ekuni was a book Tim Hallinan read and posted about a couple of months back. I was interested in it primarily because the chapters alternate between the points of view of a married couple. The book was translated from Japanese, so it takes place in Japan. The wife is a young, very confused and very unhappy woman who is married to a gay man. They both went into the marriage knowing what their situation was and the evolution of the relationship is painful and touching. I enjoyed this one quite a bit. It was a beautiful story. On Love, by Alain de Botton was a book I learned about from this review at The Book Book. It is a novel about falling in and out of love, but it’s written in the style of a series of essays. I loved this book and kept reading passages from it aloud to Scott. He actually read it after I did and he very seldom reads fiction. I adore this author and have recently added four more of his books (all non-fiction) to my TBR stack. Veronica, by Mary Gaitskill. I found Mary Gaitskill when I was bemoaning the lack of truly flawed female protagonists to Andrea Dupree, the director of my favorite place to learn writing, Lighthouse Writers Workshop. Andrea recommended Mary Gaitskill and I got what I was looking for. This was a gritty novel and when I think about how to describe it, the words that keep popping into my head are “grotesquely beautiful”. If I could craft one sentence as beautifully as Mary Gaitskill does, I would die a happy woman. How Proust Can Change Your Life, by Alain de Botton. I loved On Love, but this one may have changed my life. In a series of chapters with titles like, “How to Take Your Time”, “How to Suffer Successfully”, “How to be a Good Friend”, and “How to Open Your Eyes”, de Botton explores topics by drawing on the works and the life of Marcel Proust. This is the best book I’ve read in a very long time. I’ve been eyeballing the mammoth copy of Swann’s Way on my shelf and trying to decide how soon I’m willing to tackle it. The Sky Isn't Visible From Here, by Felicia C. Sullivan is the memoir of blogger and host of Writers Revealed, Felicia Sullivan. The author grew up in Brooklyn with a cocaine addicted mother who would never reveal the identity of Felicia’s father to her. The book alternates chapters recounting a childhood filled with poverty, insecurity and a rotating entourage of the men in her mother’s life, alternating with chapters of her own successful escape to Fordham and then to Columbia to pursue her MFA. Throughout her transformation from neighborhood girl to a successful Manhattanite, Felcia shares her struggles with identity, recreating herself and her plunge into and recovery from alcohol and cocaine addiction. Felcia’s mother disappeared the night before her college graduation and hasn’t been heard from in eleven years. This painful memoir recounts the struggle with this difficult relationship. I already thought Felicia was superwoman, but I am truly awed by all she's accomplished now that I know her story. A note to my Colorado blog pals. Please check out this post about an important bill going before the Colorado House Judiciary Committee on February 20th. Please urge Governor Ritter to support this bill on the juvenile direct file law.